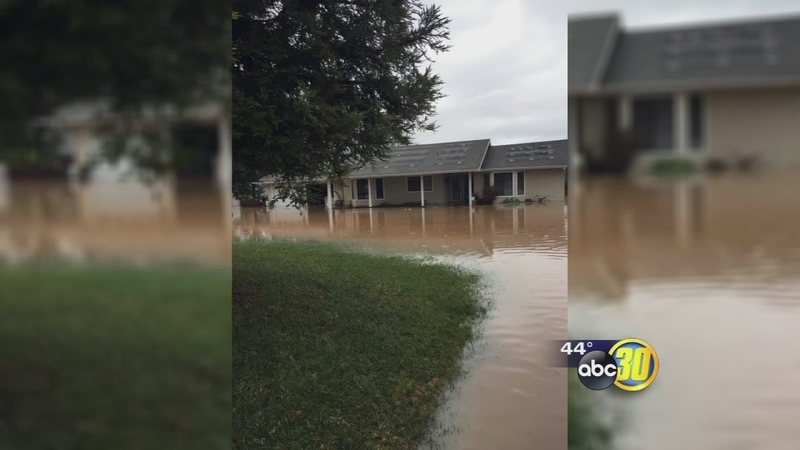 CLOVIS, Calif. (KFSN) -- Cell phone video showed more than five inches of flood water, sitting on Brianne Glick's lawn and inside her Clovis home. "It's heartbreaking and intense to see everything you own start flooding and going into despair." After days of powerful storms last week, Glick believes water from this two-year-old new development up the road had nowhere to go but to her property. "They've elevated it two or three feet and their drainage is not adequate to support the development because we've never had this issue ever in the past," Glick said. "My property is sufficient and it will take care of the water from my property, what it won't take care of is all the water from the entire neighborhood and new development." Glick's neighbor Carl Klump feels the same way. He built Gliclk's home 35 years ago and has lived next door ever since. "No, this never happened. We never had water flowing from down the street." Glick told us she spent days calling the City of Clovis' engineer hoping to get some answers and help. "I begged him to come out here and walk the flood line with me which would lead up to the development-- he refused. He refused to send anyone." So she went to the city council meeting Tuesday night to address the council. After her public comment, the city's planning director spoke with her and other neighbors having the same problem outside the chamber. He said he will be working to resolve it. "We are going to do our due diligence tomorrow and look at that and do our forensics on and try to keep it from happening in the future," said Dwight Kroll, City of Clovis Planning Director. With carpet having to be pulled up, baseboards ripped out, and dry wall needing to be removed because of mold, Glick said the repairs will cost her nearly $60,000 out of pocket. "We're not in a flood zone here, so homeowner's insurance is not going to cover anything of this here." Glick just hopes whatever the city does, if anything at all, will be a quick and efficient fix, because she knows more storms are just around the corner. "I want the city to remedy the situation and the drainage problem at the end of the street." We reached out to the City of Clovis' Engineer who Glick made calls to but have not heard back from him.